The U.S. Postal Service holds a significant amount of money. Each year over $25 million in Postal Service Money Orders are not cashed. No name or address records are kept for purchases of domestic money orders. 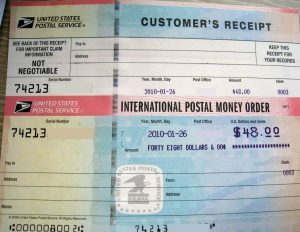 The USPS will not contact you if a money order is not cashed – you must initiate action to obtain a replacement. Copies of paid domestic U.S. Postal money orders can be obtained for up to 2 years after the pay date. If a money order is lost or stolen prior to being cashed, it can be replaced. Records of owner names and addresses are available for purchasers of International Money Orders, which are valid for ninety days after issue. For information on replacement or refund of postal money orders not cashed please contact us for an appointment.